Don’t leave reading the race instructions until the last minute! 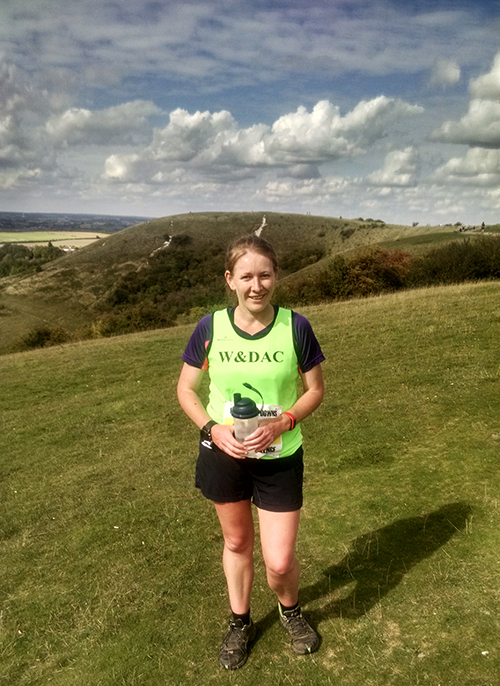 On Sunday I ran the Dunstable Downs 20m Challenge event as my last long run before Mablethorpe Marathon in three weeks time. The race was part of our club trail series, and following the race at the weekend I am now sitting in first female position overall, with another four races in the series remaining. My aim for the day was purely to comfortably get the distance in my legs before beginning my marathon taper. I didn’t want to treat it as I would a road race – with continuous running. Instead I was aiming for continuous movement throughout the course to reach the end comfortably, walking the hills and through all of the checkpoints. The weather was rather chilly in the morning and I left taking my hoodie off until the last possible second, shivering in my shorts and t-shirt that I had put on underneath my club vest. 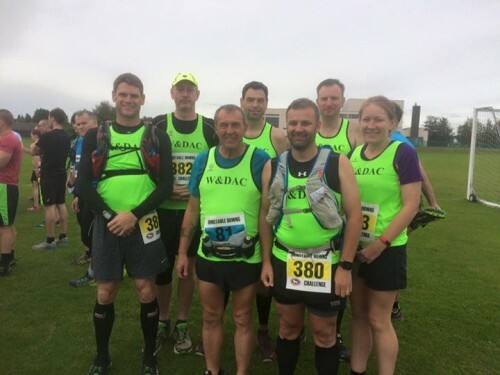 There were distances of half marathon, 20 miles and full marathon on the day, with all three distances heading off in the same direction at the start, before later splitting off to complete their own loop back to the football centre we had started from. As the 20 mile event was part of our trail series we had seven runners in the 20 mile event and one runner in the marathon. The race was very cheap compared to many (£16.55), but would have cost just an extra pound to top up to marathon distance. I had to argue with myself for a little while that it would not be productive if I were to enter the marathon instead, despite it meaning that I would be one marathon closer to completing the still-so-far-away 100 marathons! I wanted my sub 5 in three weeks too badly to jeopardize things in the end though so managed to control my finger when it came to entries, sticking with the 20 miles. I didn’t sit down to read the race instructions until the night before the race. I had meant to do this earlier in the week but had not gotten round to it. It wasn’t until this point that I discovered we were supposed to have printed off our own map and directions to bring along! I knew that it was a self-navigating course but I had assumed that we would be given instructions on arrival along with our numbers! Without a working printer at home I realised I would have to begin hand-writing instructions, as well as taking a photograph of them on my phone. Luckily, a friend agreed to print me off a copy before I got too far along writing them up. Couldn’t have dealt with cramp in my hand on race day! 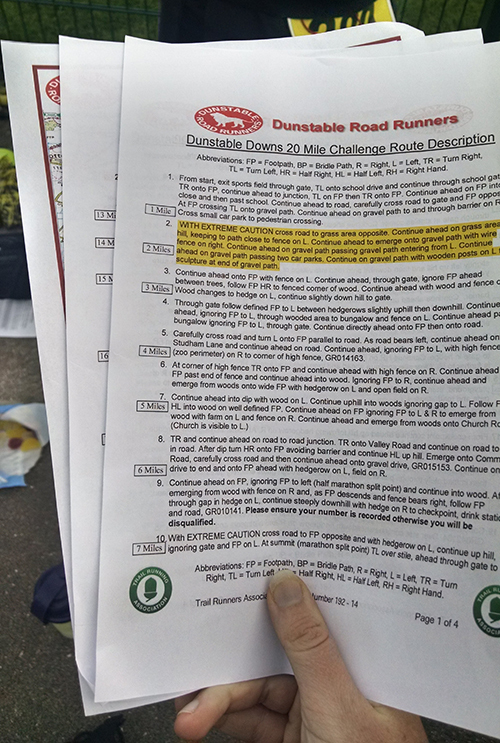 I needn’t have worried though – when we turned up the following morning there were piles of both maps and instructions printed out for runners that had forgotten theirs. During the pre-race briefing we were also told that the majority of the course had also been marked this year, following a handful of runners getting quite lost the previous year. Good job I didn’t end up having to write them all out. There were pages of them! Despite not discussing our plans before the race, I ended up running the race with another runner from our club, Ian. Good job too, as it was Ian that spotted the wallabies hidden in the long grass as we ran alongside the outskirts of Whipsnade Animal Park. I’d had mixed feedback on how hilly the race was. One person told me it was incredibly hilly and another told me that there was no hills of any size on the course. I decided it was probably best just to wait and see in the end. Turns out it looks pretty hilly on the course elevation profile, but I didn’t really notice the hills when I was out there – they weren’t so tough! Especially after having run those 19 hilly road miles the week before! One hill I did notice was the steep downhill to the first checkpoint at mile 7. The turn-off for the half marathon runners was just before we reached the downhill although several of the runners had missed the turn-off point despite it being clearly marked. We met one poor guy heading back up to the top of the hill who had just run all the way down to the checkpoint before being told to turn around and head right back up again so that he was on the correct path! The marathon runners then left us about half a mile further up the track. 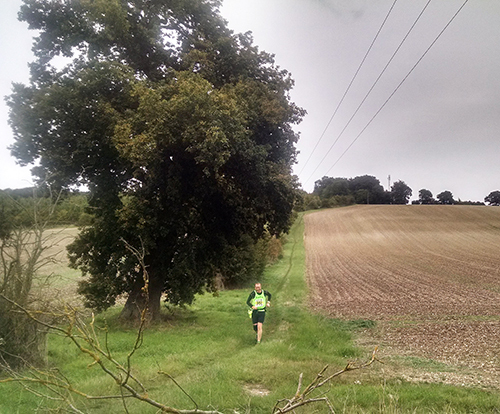 The next rather memorable part of the race was as we headed down into a large valley through several fields. Fields that had recently been ploughed! 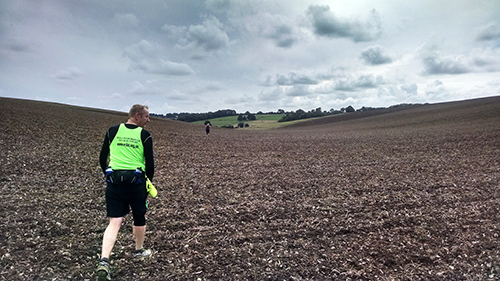 Too close to marathon day to risk turning an ankle, so we walked across the worst parts of this field, using our walking time wisely to catch up on map-reading directions, eating, drinking and taking photographs! The mud was rather clotted and the ground rather stoney and rutted. At mile 10 we came across our second checkpoint of the race. Just an informal one – a guy holding a clipboard and a chair which was filled with bottles of water and Twix bars. This was the point where the marathon runners rejoined those running the 20 mile race and just as we arrived here, the lead marathon runner came through. It was a long while afterwards before we saw the chap in second place, so I presume that the guy we saw come past here was the eventual winner. Ian and I split a Twix and continued up another gradual hill. This one must have been alongside a sewage works or something, because it was incredibly smelly! It had started to get warm by this point, so please excuse the frazzled hair and sweaty neck look! 😉 The next checkpoint had it spot on. A full on feeding station! There were gummy sweets and flapjacks, cake and shortbread. I helped myself to a slice of flapjack and piece of shortbread. Nice little boost to get round the final few miles! One of the runners from our club later pointed out that there had been no savoury goodies here though, which I hadn’t spotted at the time. If I had been running a longer race I would have wanted savoury over sweet. The last few miles were the same as the first few and took us along the ridge of the Downs. Looking over the edge you could see gliders and planes constantly taking off and returning to the field again. There were lots of kite fliers and dog walkers out by this point, enjoying the weather since the heat had increased. Here I am at 19.5 miles along the top of the ridge. Ian offered to take my photo here, but even if he hadn’t, I could probably have asked another runner to take it for me. Gotta love trail races! Couldn’t imagine doing this with half a mile to go in a road marathon! …Except it ended up being more than half a mile to go. As we reached a fork in the route Ian insisted that he recognised the trail on the right. I could see more runners up ahead on the path to the left so assumed that they were probably headed in the right direction. Many of the runners had seemed to have run the race previously, or were local to the area. I asked a couple that were sat at the side of the path and looked as though they had been there for a while. They backed me up that it should be the left path we should take. Ian still insisted right, so right we went! I’m not sure that we took entirely the correct route here, but it came back out onto the main track again before long and I don’t think that it added much, if any distance to the run. On the race instructions, the 20 mile race was labeled as 20.8miles, and my Garmin recorded 21.13 in total. Last long run done! Next weekend I shall be running Royston trail half marathon, and then slotting in a small and easy run the following weekend, which will be the last weekend before Mablethorpe. After crossing the line, Ian and I joined the other Wellingborough runners on the bank at the finish line to wait for our sole marathon runner to come through the finish. The others estimated he would be another 45 minutes or so, so I took this opportunity to collect my kit bag, which I’d left in the luggage area and I also changed into my hoodie for warmth. 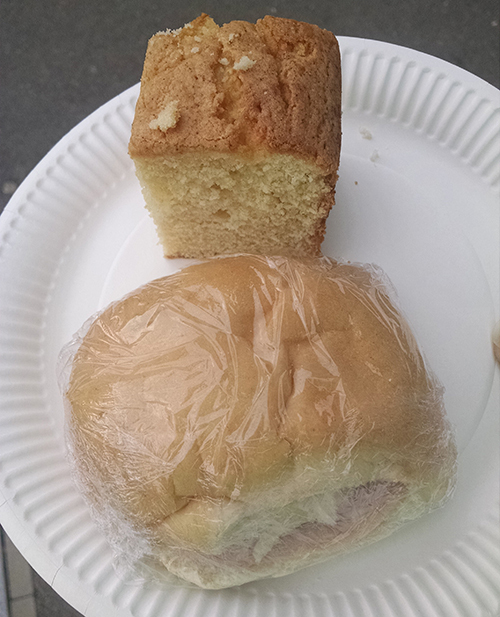 Whilst inside, I picked up a ham roll and slice of cake – an additional free incentive for all runners to complete the course! 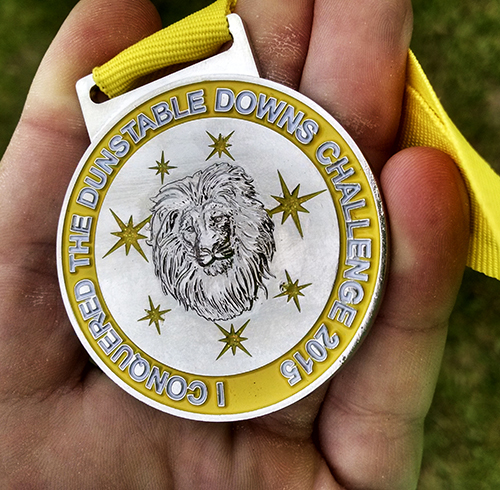 The medal is a nice one, and shows a lion with the words I conquered the Dunstable Downs Challenge 2015′. The race distance was written on the ribbon and each distance was also represented by a different colour. Yellow for the 20 milers. 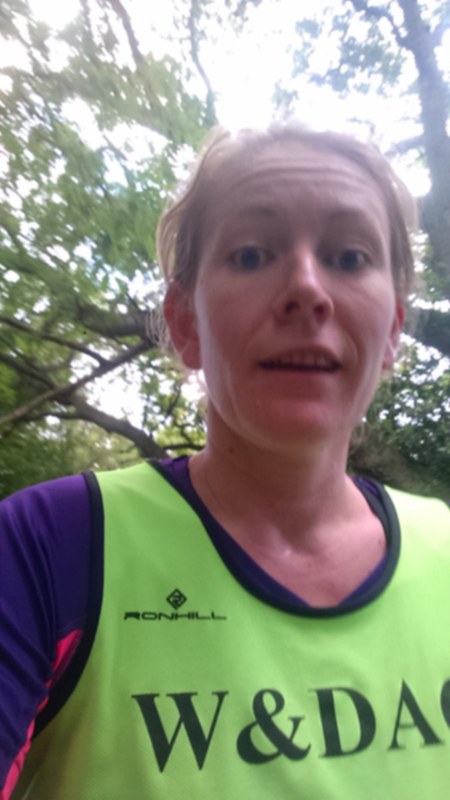 Are you training for an Autumn marathon/half? Have you attended races where you get free food at the end?! Ploughed fields – run them or walk them?! That does look like a lovely race! Definitely with you about walking ploughed fields – if nothing else, all that mud that sticks on makes it so much harder to make any progress if you run! When it has been really wet and boggy I’ve come out of the other end of a ploughed field a good couple of inches taller than when I went in! Firstly, nice that you’re top of the table at the moment. Whoop! Oh I am terrible at reading instructions (being late to Cheddar Gorge an example!). I just always assume someone else will tell me what to do which is both pathetic and stupid. I have learnt to become more self-sufficient now!! I’d have definitely walked the field as well – not worth risking it!! Sounds like a great race. I love how relaxed trail races are. Lots of selfies, admiring scenery, chatting and, well, “wombling”! Nice work on those hills, I’m sure it would feel hilly to me as I’m not quite as trail-experience as you are. Cheddar Gorge had loads of food during and after which was nice. Lots of sweet and savouries. The race organisers (Relish Running) always do a good spread. A few of us from my club are doing another one of their races this weekend: the Bath Two Tunnel half. I won’t be racing but running with a guy to help him PB so I’m quite looking forward to it. Not quite an easy easy run but somewhere near marathon pace so should be interesting. Good luck for your race! Thanks Anna! Still top of the table after a strong half marathon yesterday as well. Looks like I am in with a good chance of staying top for the remainder of the year now! Was the Bath Two Tunnel half a trail race? You were helping a guy PB on a trail race?! 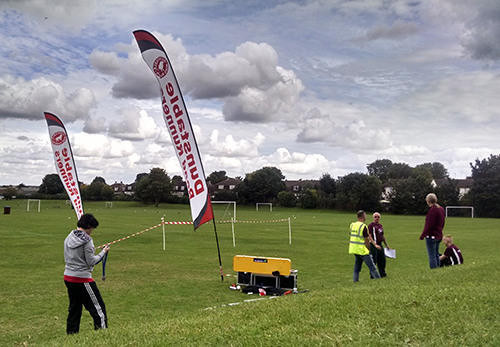 I love going to different races run by the same organisers, and trying some different, but still fab events. You usually know what to expect then, despite the event being a different course. Nice work! It’s so pretty around there- we always used to fly kites there when we were younger. Some of my friends did the half, and got lost at the end so ended up with 14 miles or something, but I think trail races are more relaxed and flexible. 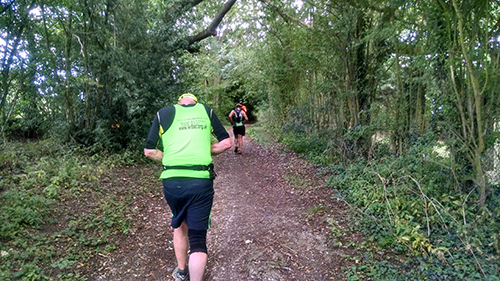 The self navigation scares me- the Ashridge trail race I did was like that and at one point I did get lost, but luckily someone came up behind me and worked out on the instructions where to turn! It’s beautiful out on the Downs. I’m not sure how the half was run, but the 20 mile distance returned to the race HQ by the same way it went in, so when we went slightly off-track we could luckily still work out where we were meant to be! Hope your friends enjoyed the race as well! Ploughed fields are the worst- so energy sapping! Looks like a good race. I’d be terrible at self navigation, I’ve got lost during two trail races that were marked in the past- so not much hope for me. Well done! Great looking medal – love the lion! The scenery looks beautiful, though I’m not sure about freshly ploughed fields being part of the course. Self navigation even if it’s five minutes to the shops is not one of my strong points, I have zero sense of direction so I think I’d be terrible at a race like this. Well done for completing it! Thanks Claire! The course was marked pretty well to be honest. I’m not sure how well I would have gotten on had I been just following the written instructions! I’m having a panic attack just looking at those pages and pages of race instructions! What a navigational nightmare. The medal is just beautiful, but I very much doubt I’d ever get to the finish line in one piece to receive it. I’m always impressed with the variety of races you do, both in terms of technical terrain and self-directed navigation. I would try to run through those fields, but the minute I felt my ankle roll even slightly I’d slow to a walk. It’s not worth it to twist or sprain an ankle for the sake of one race. I’d be a bit put off by a field like that to be honest – I’d already be anxious enough about getting lost! Some of the instructions were very rambling and a little confusing, so I am glad that the course was marked the majority of the time! You say you would struggle to get to the finish line, but you did a great job self-navigating at Shires and Spires on an unknown course and coming in second. I hope that you are able to make the Yorkshire Marathon. It looks like you had a really good run at the GNR this year, so fingers crossed that everything falls into place for you. There are lots of training plans out there that suggest there are no real benefits to training more than 13-15 miles in the build up to race day anyway. I think your body will do a good job of remembering all the miles you have put in previously.